perusing potential china acquisitions, always inspect for cracks – even those under the surface of the glaze. Sometimes if you hold a potential purchase to a light, you can see them better. Use your fingers to feel for any heavy cracks or chips that could impede your purchase’s use. But if you’re attracted to a plate for its pure decorative allure, why, throw caution to the wind. Hang it on the wall, use it as a fanciful charger or crunch up a whole bunch of them and create a mosaic on a tabletop. 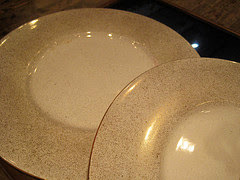 Now these Este gold plates at shophousingworks.com look perfect. Hurry on over to bid, because the auction ends in a few days! For other thrift inspirations, pick up my book, The Find, The Housing Works Book of Decorating With Thrift Shop Treasures, Flea Market Objects, and Vintage Details at Amazon, Barnes & Noble, Borders andPowell's. When you find a fabulous new thrift store, you almost want to keep it a secret because its wares are so fine that you want it all to yourself. 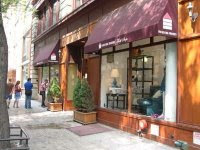 But when it’s a benefit re-sale shop like The Cure Thrift Shop at 111 E. 12th St., that benefits the Diabetes Research Institute Foujndation, you want all well-heeled New Yorkers to know where to donate their best cast-offs. I’m always amazed by my visits there, and can never just drop in witout picking up a thing or three Recently, I found a Radio City Music Hall program from the 1950s and turned it into a gift for a dancer friend. And then I found this funny compact with a glittery dollar sign atop it, a perfect boost to anybody’s economy! For other thrift inspirations, pick up my book, The Find, The Housing Works Book of Decorating With Thrift Shop Treasures, Flea Market Objects, and Vintage Details at Amazon, Barnes & Noble, Borders and Powell's. 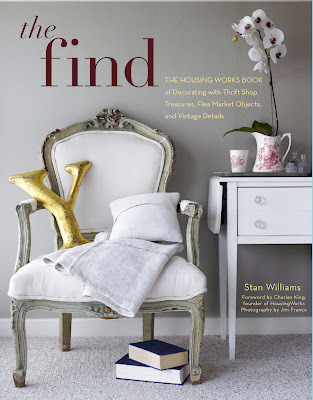 Yasmine McGrane's work is featured on the cover of The Find: The Housing Works Book of Decorating With Thrift Shop Treasures, Flea Market Objects, and Vintage Details -- and gorgeously photographed by Jim Franco. Yasmine is known as one of the best flea market shoppers in the country. And among her favorite pastimes is hitting the Alameda Point Antiques and Collectibles Faire in Alameda, Ca., looking for antiques, whimsical accessories and taking in the thrill of the gorgeous outdoor market. The owner of Maison Reve, a suburban country home that encourages creativity, is always on the hunt for antiques (not reproductions! ), old doors, French metal garden chairs, and any other whimsical items, be-it a wagon load of Christmas balls or a dainty feathered tree. With an itch for a flea – The Elegant Thrifter, Always Frugal, Always Fabulous! For more pictures of Yasmine's amazing work, pick upThe Find: The Housing Works Book of Decorating with Thrift Shop Treasures, Flea Market Objects, and Vintage Details at Amazon, Barnes and Noble or Powell's. The Object of My Desire: Boxed In and Up! I'm always pleasantly taken aback by objects created out of wit and charm, especially when I am introduced to them in an unlikely locale, say the John Barrett Salon in Bergdorf's. After my dear friend had trim, I started chatting with Head Stylist Ted Giza about my upcoming book, The Find: The Housing Works Book of Decorating With Thrift Shop Treasures, Flea Market Objects, and Vintage Details, and then he flipped out his iPhone to reveal an object so fabulous that I couldn't believe my eyes. There in his palm was a photo of a reuse and repurpose masterpiece -- a massive tower of Hermes china boxes that he installed in his gorgeous, sun-drenched 1,200-square-foot loft in Asbury Park, NJ. Ted wedged some 48 boxes of varying depths and sizes from floor to ceiling to create his awe-inspiring sculpture, which he dubs, "Excess 2008: Medium Hermes Boxes." unexpected objects, pick upThe Find: The Housing Works Book of Decorating with Thrift Shop Treasures, Flea Market Objects, and Vintage Details at Amazon, Barnes and Noble or Powell's. As the weather warms, I love nothing more than taking a stroll through a bustling flea market, full of fanciful wares that spark the imagination. This morning, I took a virtual trip to Alameda Point Antiques and Collectibles Faire in Northern California, known all over as one of the best flea markets in the country. I had a few "ah!" moments flipping through the photos on the Web site, and am sharing a couple here. I hope you enjoy them as much as I did. Pick up my book, The Find: The Housing Works Book of Decorating with Thrift Shop Treasures, Flea Market Objects, and Vintage Details at Amazon, Barnes and Noble or Powell's. Saturday Surprises: Caught on Video! Dolly Parton is a rags-to-riches success story. From a little girl growing up poor in the Tennessee Appalachians to the mega-music icon of today, Dolly is always an inspiration. With all the nips, tucks, wigs and makeup, you could also make a case for her being the country music queen of re-use and re-purpose! Oh she's re-invented herself many times over the year. Either way, we all love Dolly. She speaks from the heart, even though her exterior sometimes distracts from her message. Savor her new Backwoods Barbie video here. Pick up my book,The Find: The Housing Works Book of Decorating with Thrift Shop Treasures, Flea Market Objects, and Vintage Details at Amazon, Barnes and Noble or Powell's. The Gift of Thrift: Hooching Away! Invite me to your party, and you're sure to get a hostess gift -- probably one of my naughty-but-nice Hooch Bags, a vintage pocketbook filled with a ton of funny money, a discrete nip and a thrift-store surprise. Here's a lovely I call Sabrina that I offered a gracious hostess last night. I've told Sabrina not to drink and drive, but that doesn't stop her. And she insists on smoking AND putting on her lipstick in the review mirror while speeding down the 405! Will she ever learn? Check out her pal Fifi at Hooch Bags by The Elegant Thrifter. The Gift of Thrift is always in style, The Elegant Thrifter, Always Frugal, Always Fabulous! For more thrifty tips, pre-order The Find: The Housing Works Book of Decorating With Thrift Shop Treasures, Flea Market Objects, and Vintage Details shop at Amazon, Barnes and Noble or Powell's. Decorators may hate me for saying this, but making a sofa your first purchase for your living room is probably a smart move. Let’s face it, it’s probably the most sat on -- and napped-on, lounged-on and kissed-on -- piece of furniture you’ll invest in. So do spend some time picking out a vintage or thrift-store sofa. If you live like I do in a one-bedroom apartment, then you don’t have the luxury of an extra den, a library or, heaven’s help me, a media room! If you're comfortable with the upholstery already covering a thrift sofa, then you’re ready for step two. How does it feel? Take your shoes off and lounge on your find every way you can, long-wise, sideways and upside down if you want! But make sure to give your potential purchase a long whiff during your try-out mode. Thrift furniture that smells funny will only worsen once you get it out of the musty store. Keep your ears open for any creaks and moans that might emanate from your furniture –possible signs that the frame is disfigured or springs broken. And finally, know your measurements – of the space you want to fit your sofa in, the doorways, the stairs and any odd bends along the way. One of the biggest disappointment in finding your dream, thrift-store sofa is not being able to fit it through the front door. 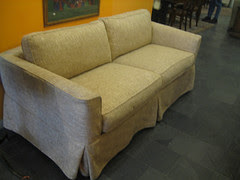 Here's a fabulous, simple and practically new Mitchell Gold sofa up for bid right now at shophousingworks.com, one that would fit into almost any decor. With a tape measure in hand – The Elegant Thrifter -- Always frugal, always fabulous! For more tips on buying great thrift, pre-order The Find: The Housing Works Book of Decorating With Thrift Shop Treasures, Flea Market Objects, and Vintage Details shop at Amazon, Barnes and Noble or Powell's. The garage sales of Ruth Handel and Johanna Went are the kind of legendary events that LA thrift and vintage shoppers mark in red ink on their must-do lists. “We have regulars who show up year after year because they know that they will always find good things on the cheap,” Ruth says. Recently, the two joined forces with family and friends to create a garage sale where proceeds went to Los Angeles Retarded Citizens (LARC), a living environment that 100 Downs Syndrome residents – including Ruth’s brother, Danny -- call home. Family members manned (and womanned!) the money box, neighbors brought over snacks and treats and friends turned it into a big block party party, one that raised hundreds of dollars for LARC. Ruth, who has always loved shopping thrift and discovering garage sale treasures, is passing that skill on to her son, Jobim. She remembers taking him at 18 months old to a garage sale he couldn’t tear himself away from a sponge toy baseball that he was dying to get his hands on, Handel says. “So now every time he sees jumble of stuff sitting in a yard that looks like it might be for sale, he always says to me, ‘Mommy, there’s a garage sale. Let’s go find a treasure!’"
For a massive treasure hunt in New York, click on the link to buy tickets to Housing Works' Design on a Dime event on May 7, where all proceeds go toward eradicating the double crisis of HIV/AIDS and homelessness. Tons of fun, amazing merchandise, and bargain-basement prices. Family Fun from The Elegant Thrifter – Always Frugal, Always Fabulous! For your own copy of The Find: The Housing Works Book of Decorating With Thrift Shop Treasures, Flea Market Objects, and Vintage Details shop at Amazon, Barnes and Noble or Powell's. I usually reserve this section for inspiration and snippets from my book The Find: The Housing Works Book of Decorating With Thrift Shop Treasures, Flea Market Objects, and Vintage Details, but today a very special arrival made its way to my door. It was a big box brimming with copies of my beautiful book. As I shred off the tape and pulled back the cardboard flaps, I felt like a kid on Christmas morning. The arrival was just the boost of self confidence I asked for today. Having put my heart and soul into this project, I sometimes felt like I was on a solitary mission. It was a goal I happily pursued. Hey, I quit a big magazine job to do all this, but it's easy to be distracted by self-doubt, especially since I was off into territory I had never traveled before. As my dear pal Bevy Smith says, "It's in the Library of Congress baby....forever!" Wow! That's a nice thought to register. For your own copy of The Find: The Housing Works Book of Decorating With Thrift Shop Treasures, Flea Market Objects, and Vintage Details, shop at Amazon, Barnes and Noble or Powell's. The Object of My Desire: Duly Noted. I almost passed up these greeting cards from Historic Williamsburg -- the one in Virginia, NOT Brooklyn! The stationery wasn’t something I was looking for when I was poking around at the Brooklyn Flea Pop-Up Market the other day, but having dug through old pieces of car logos and mis-matched cufflinks, I was about to give up and go home until I landed on this set of whimsical stationery that was still in their boxes and completely useable. One set features authentic settings of people gathered, either in the middle of a chore or enjoying a meal, all in period outfits, of course. And then there's another box of authentic recipes to re-create over a wood-burning fireplace and a cast-iron kettle. Clearly the person who purchased these back in the 1960s loved them so much that she couldn't bear to break up a set by actually using them, since all three boxes have their cards and envelopes in tact. Watch your mailbox for a note from The Elegant Thrifter – Always Frugal, Always Fabulous! For some indoor fun, order my book The Find: The Housing Works Book of Decorating With Thrift Shop Treasures, Flea Market Objects, and Vintage Details at Amazon, Barnes and Noble or Powell's. Sublime Sundays: Have a Loopy Day! Worlds of Fun opened yesterday!! As the weather warms, I always think of my all-time favorite job in the 1980s as a photographer at this MidWest theme park. 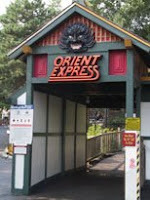 Unfortunately, the exotic Orient Express -- the largest steel roller coaster of its time -- is gone, but the park is still there. 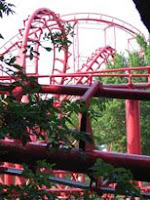 I still remember the whoosh of the air brakes as the rollercoaster cars zoomed into the station, and the distant squeals I could hear all the way across the park as guests hit that very first drop and then a second round as they entered the first full-on loop. I love this picture on the left, because this was what I always hoped to find at the entry...no one waiting in line. But on gorgeous spring days like today, that was never the case! Fun in the sun from The Elegant Thrifter -- Always Frugal, Always Fabulous! Watch footage old and new, plus and minus the 'stache and Starr Jones with extra poundage. Click on the link, and it'll download. Always Frugal, Always Fabulous....and a free video from The Elegant Thrifter. For some static entertainment, order my book The Find: The Housing Works Book of Decorating With Thrift Shop Treasures, Flea Market Objects, and Vintage Details at Amazon, Barnes and Noble or Powell's. I had no idea what I was going to come up with, but thanks to my periphery vision that was set for a treasure, I spied beyond a blue and yellow cardboard wheel, probably from the 1960s, called “The Ballet for the Beginner,” decorated with delicate sketches of tutu-clad girls in ballet positions ($5!). Dial a position, such as a grand plié, and a pronunciation shows up in one window and a definition of the term in another. I was on to something. Wheel in hand, I returned to the housewares area and there was the second find: a gorgeous, pink pressed glass candy dish ($6!) exactly the same diameter as the wheel.What if the wheel became a lid for the dish? All I needed was a topper for my creation, and across the way, there it was: a curvy pink wire sculpture of the Eiffel Tower ($4!). My grand total was $15 plus tax, with just enough money left over to fill the dish with Swedish Fish candies, jellybeans and gumballs. The towered ballet candy dish has layers of discoveries. Certain to delight -- and gentle on the wallet! The Find: The Housing Works Book of Decorating With Thrift Shop Treasures, Flea Market Objects, and Vintage Details at Amazon and Barnes and Noble. Perfect for the hostess with the mostest! Reuse and Repurpose: Go To Bed! Sometimes moving furniture from room to room will uncover unexpected uses and provide for an original design option. One of my favorite thrift finds is a pair of Florence Knoll cabinets purchased at a vintage shop in the East Village. I admit to paying too much for them (I won’t reveal the actual price tag, but now I know better! ), but they have become a trusted and beautiful addition that serve double duty in my bedroom. Since I live in a one-bedroom apartment in New York City, I have to maximize every nook and cranny. So while my wooden cabinets serve as sturdy nightstands, they also double as effective file cabinets that hold tons of papers and documents. You can use less expensive file cabinets, even metal ones, and paint them a color that goes with the theme of your bedroom. File cabinets are a plenty at thrift stores. Just make sure that your purchase is sturdy and can hold everything you plan on putting away inside. Decorating Options from The Elegant Thrifter – Always Frugal, Always Fabulous! Purchase my book, The Find: The Housing Works Book of Decorating With Thrift Shop Treasures, Flea Market Objects and Vintage Details on Amazon.com and Barnesandnoble.com. I snapped this image as I was scouting fashion designer John Bartlett and master framer John Esty’s West Village apartment for print consideration for my book, The Find: The Housing Works Book of Decorating With Thrift Shop Treasures, Flea Market Objects and Vintage Details. 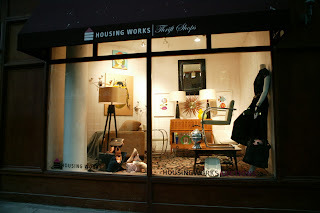 Check out the Johns' work at Housing Works' Design on a Design Event on May 7. Visit www.shophousingworks.com for more info. 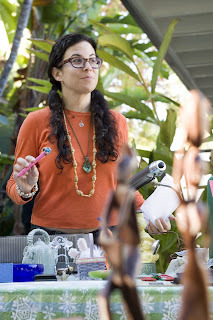 Lucky Charms to you from The Elegant Thrifter – Always Frugal, Always Fabulous! Buy The Find by clicking on Barnesandnoble.com or Amazon.com. Reserve your copy of The Find: The Housing Works Book of Decorating With Thrift Shop Treasures, Flea Market Objects, and Vintage Details at Amazon.com. Country Living is the first consumer magazine to offer a taste of The Find: The Housing Works Book of Decorating With Thrift Shop Treasures, Flea Market Objects, and Vintage Details (Clarkson Potter). 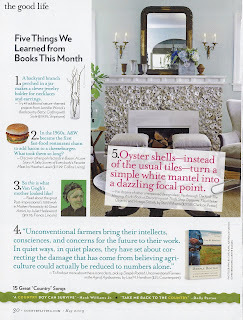 On page 30 of the newly-revamped magazine is Coastal Living Heather Chadduck's oyster-shell encrusted fireplace as featured in The Find. It's a fabulous idea that Heather had when she was deciding how to add charm to her fireplace in her Birmingham, Alabama, home. She took buckets of oysters from a local seafood restaurant -- after they ran them through an industrial dishwasher several times -- and Heather simply pieced together a whimsical puzzle on her fireplace with nothing more than tile mastic! I say one shell of a mention! What do you say to a guy when he tells you he is a crochet artist -- one that specializes in a masculine art form of the time-honored handicraft? I say, get your stitch on! I met Nathan Vincent a while back, and when he showed me his work on his iPhone, well, I was entranced. A life-sized lawn mower? A urinal? A full-on bear pelt? Even a working recliner? But it was the dainty doilies that really caught my eye -- ones that featured masculine motifs, such as a Superman logo or a wrench, in the center of a dainty frill of crochet thread. Nathan is a super chap, with a quick wit and nimble fingers. Check out Nathan by clicking on the Martha Stewart show here! 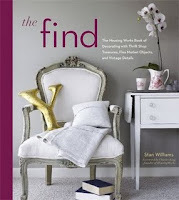 While you're at it, click on Amazon and pre-order my book, The Find: The Housing Works Book of Decorating With Thrift Shop Treasures, Flea Market Objects, and Vintage Details. Sublime Sundays: Happy Easter Esther Oyster! Those of you who know me from The Object of My Desire may remember this story, but I think it merits retelling, especially since it's Easter Sunday. A few years back I found this whimsical oyster plate at Housing Works in New York. I loved the plate because of its life-like spaces shaped to nestle its seafood offering. And even though I don't care to eat these bivalves, I do laugh every time an old friend tells me about one of his Easter traditions. "Happy Easter, Esther Oyster! " Pre-order my book, The Find: The Housing Works Book of Decorating With Thrift Shop Treasures, Flea Market Objects, and Vintage Details by clicking here on Amazon! Welcome to The Elegant Thrifter -- piping hot, deliciously familiar and a whole lot of decorating and entertaining fun. If you've been here before, you'll notice I've been busy reformatting The Elegant Thrifter's Web presence, and digging up new delights to share. And if you're coming from The Object of My Desire, then you'll remember some old favorites stepping in for an encore. This weekend is a great time to reserve your copy of The Find: The Housing Works Book of Decorating With Thrift Shop Treasures, Flea market Objects, and Vintage Details. It hits bookshelves on May 5, but you can have one delivered to your door by ordering here on Amazon.